As January is here and the cold wintry season is in full effect, we’re warming up with some hot cocoa. 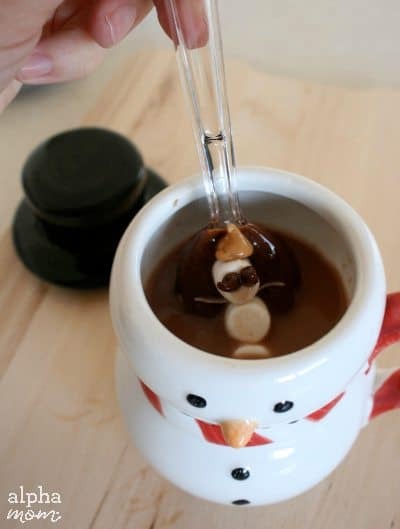 But the best part is, dipping our Hot Chocolate Spoons into it! 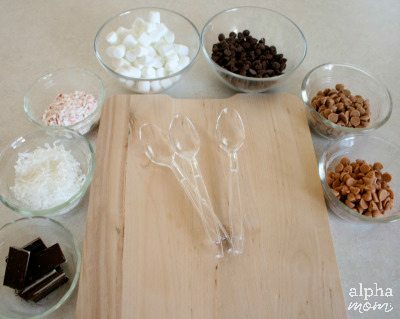 These spoons are easy to make and fun to eat, helping beat those winter blues! Have your supplies out ready to go. Heat up your chocolate chips for spoon dipping first. 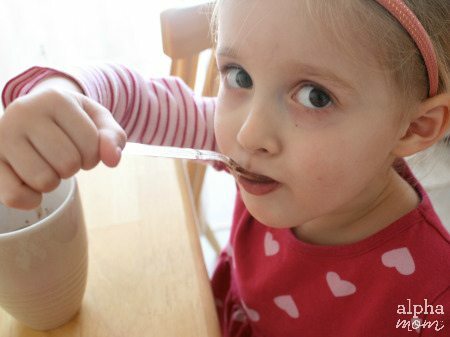 Place a 1/2 cup of chocolate chips in a microwave safe bowl and microwave for 1 minute. Take it out and stir, then continue to heat it for 20 second intervals until melted. 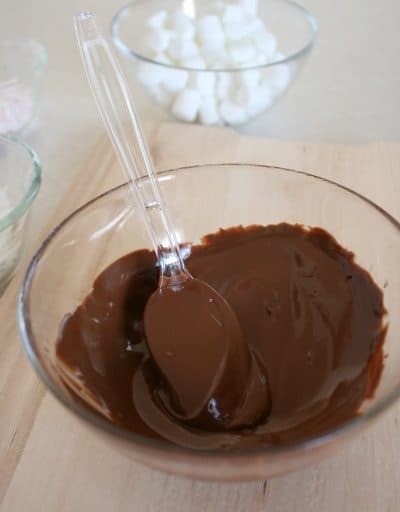 Once your chocolate is melted, dip your spoon into the bowl. You’ll need to stir it around and turn it over to make sure you’ve got it all covered in chocolate. Then set the spoon onto a plate covered in wax paper. When you’ve got your spoons dipped, it’s time to decorate them. 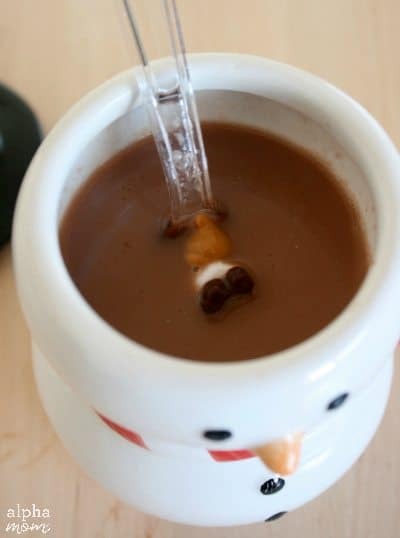 For the snowman, place 3 marshmallows in a line down the spoon. I topped one with a peanut butter chip for the hat and a flake of coconut for the scarf. Then two mini chocolate chips get a tiny dip of melted chocolate on the bottom of them before you place it on the top marshmallow for the eyes. Cute! We made a few different kinds of dipped spoons. One is dipped in melted peanut butter chips with mini chocolate chips all over. We call that one the “chocolate chip cookie” dipped spoon, and it is my favorite one dipped in hot chocolate! We also sprinkled coconut on one to look like snow. Melted mint chocolate with crushed peppermint on another, and a melted butterscotch chips spoon with drizzled chocolate on the top. Mmm, Mmm! Now this is one tasty snowman! 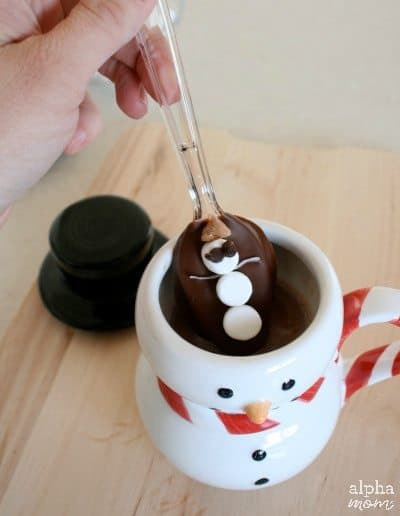 Have fun dipping your snowmen spoons in chocolate! Also, just wrap in cellophane and add a pink or red bow and you’ve got great Valentine’s Day gifts (not that we’re thinking that far ahead or anything). How wonderful! What a great “snowday” project for the kids and me! What a darling project. A whole group of these in a cellophane bag would be such a cute snowy day present! Love the snowmen! I will definitely be giving those out next Christmas. 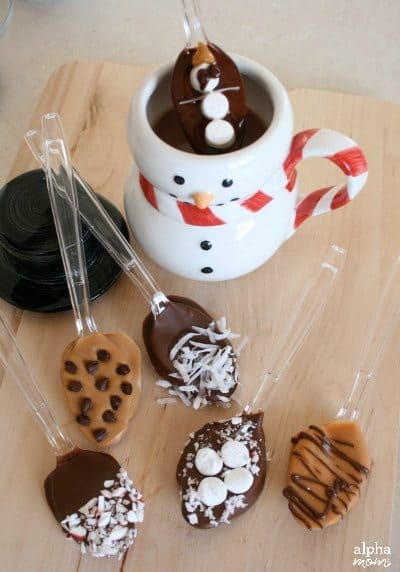 oh my gosh – this is SOOOOO cute!I cannot wait to make these for an upcoming weekend ski trip with friends – they will love them!!! those are soooooooooo adorable!!!! I love them!! 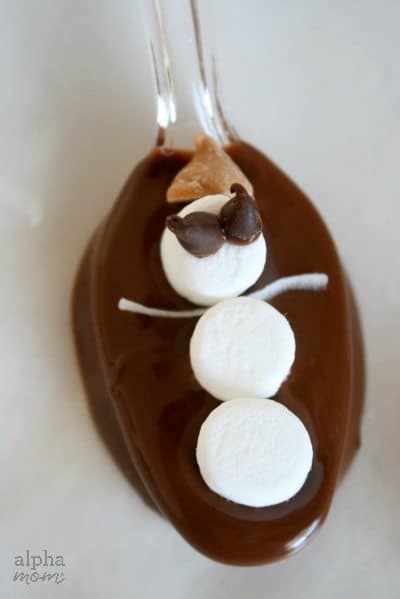 I love the snowman spoon!!! Those are adorable. I bet my boys would love them! Awwwww !! These are so cute – perfect for kids parties .. I jus love food art !!! it looks lovely… but the plastic spoons don’t fit with the ‘feel good’ theme. Why not use wooden sticks or spoons? This is too cool! It would make my hot chocolate and coffee mornings much happier. 😉 Thanks for the tutorial/recipe! What fun! 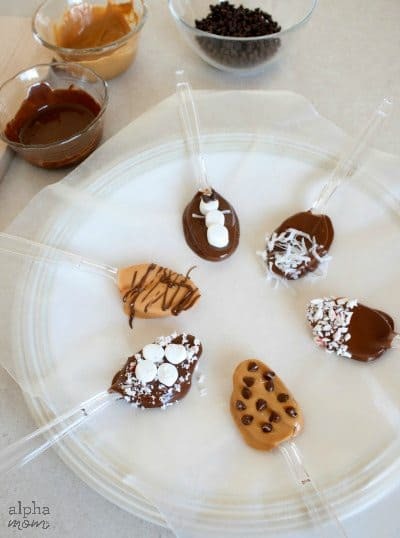 I’m going to make these with the grandkids this weekend!Thanks for sharing. These are great even for Valentine’s Day now. I really love the coconut ones.. I don’t even need coffee, I’ll just eat the spoons please. 🙂 YUM! Thanks for the great idea! Just made these for a valentine’s day treat; they are adorable and fun to make. We tried white chocolate, too, and found that it re-hardens very quickly, so next time I’ll use it immediately after melting it. It worked well to add a little red food coloring to some of the white chocolate and squeeze some cute pink hearts on top of the white or milk chocolate. YUM! Looks great, but doesn’t plastic in hot water melt and cause health problems? Is there any other material I can use? I like to make mine ahead of time. Is there any suggestions for storing?